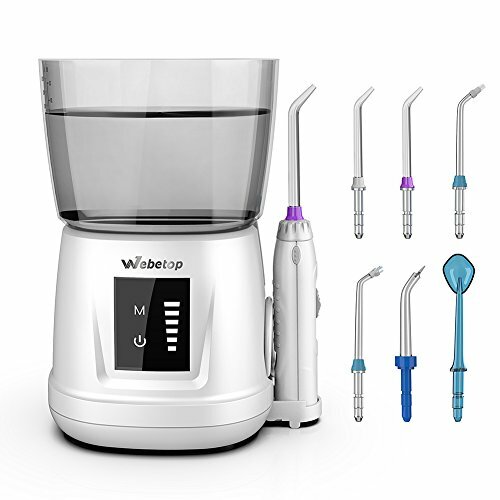 Touch Screen -- The water electric flosser with touch screen panel operation in market (unlike other products use knob control), make it more convenient and easy to clean. 1000ML Large Water Tank -- 180 seconds of uninterrupted dental flossing. The reservoir uses double sealing rings to prevent water leakage reliably. Massage & 6 Pressure Setting -- Massage Mode is effective in gingival stimulation and pressure setting from 20 to 120 PSI meets the demand of fresher and experienced. This dental flosser is the best tool for oral care in healthy populations. Memory Function -- The professional water dental flosser can automatically remember the last pressure mode when you use it more than 3 seconds.It comes with 6 jet tips, including 2 Classic Jet Tips, 1 Tongue Cleaner, 1 Dental Plaque Tip, 1 Orthodontic Tip and 1 Periodontal Tip for daily usage（The premise is to keep the power on, the machine will reset if the power is off）. Leak Proof Water Hose -- The water pipe is made of high quality EVA material and has 3 years limited manufacturer warranty. 110-240V universal voltage for general worldwide use, adapter plug may be necessary depending on the country. If you have any questions about this product by Webetop, contact us by completing and submitting the form below. If you are looking for a specif part number, please include it with your message.